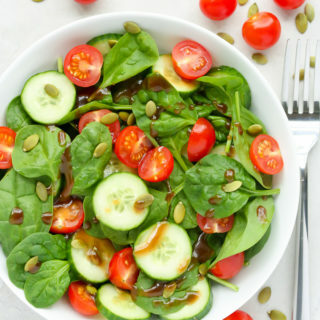 This Cherry Tomato Spinach Salad recipe is crisp, refreshing and so simple to make. It is also a very easy way to incorporate more vitamins, nutrients and antioxidants into your diet. You are going to love this tasty, superfood salad because it uses simple ingredients and takes only 10 minutes to prepare. It is the perfect side salad to accompany a soup and sandwich for a filling lunch or dinner. 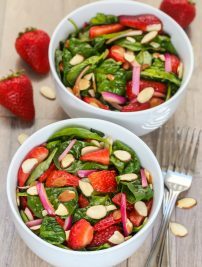 This salad is also a great dish for entertaining or bringing along to a potluck, because it is bright, colorful and looks super appetizing. Fresh Spinach is only 7 calories per cup and is an excellent source of Vitamin K, Vitamin A and folic acid. Spinach can also protect heart health by improving the functions of nitric acid, which improves circulation, blood pressure, and blood vessel health. Cherry tomatoes (all tomatoes actually) are rich in antioxidants and Vitamins A & C. They are the best source of lycopene, an antioxidant that is tied to enhanced immunity and cancer risk reduction. They also contain a compound called lutein, which protects eye health and preserves eyesight. Cucumbers are fantastic to add to salads because they are very low in calories and are 96% water by weight, so they are super hydrating. Pumpkin seeds are a terrific plant-based protein source as they contain 9 grams of protein per 1/4 cup. They are also an excellent natural source of magnesium and zinc. Finally, my honey balsamic vinaigrette is made mostly with extra-virgin olive oil and balsamic vinegar, in a 3:1 ratio of oil to vinegar (that’s the perfect ratio for salad dressings). Honey, mustard and a little S&P are added into the mix for more flavor and to help the oil and vinegar hold together. When preparing the dressing, I always like to shake the ingredients together in a jar rather than whisking them in a bowl, because I find the vinaigrette combines much more easily that way. If you are making this salad in advance for a party, do not add the dressing until you are ready to serve. This will keep the salad crisp and prevent it from becoming soggy. Glass Mixing Bowls – This set is perfect for mixing up and serving salads. The bowls are so easy to store (as they nest together) and they look great! Stainless Steel Measuring Spoons – This is the best set of measuring spoons I have ever purchased. They are super durable, inexpensive and the quality can’t be beat. 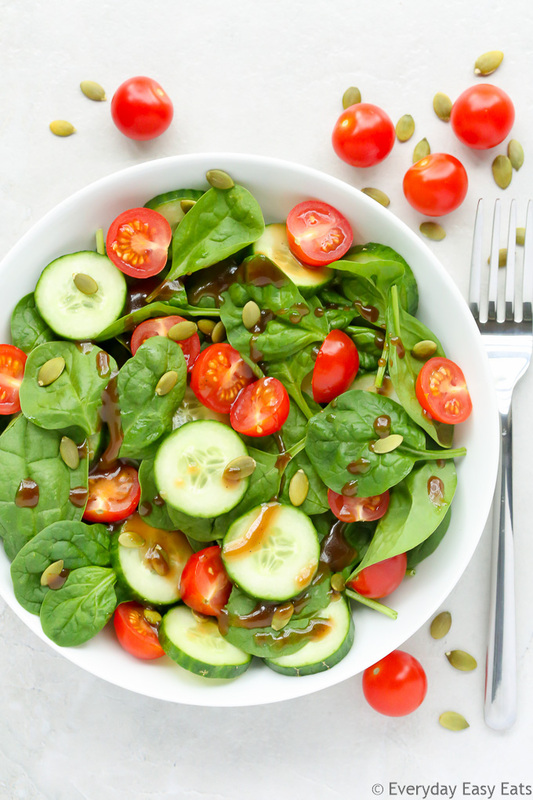 A quick, super healthy salad made with fresh baby spinach, cherry tomatoes, cucumber and pumpkin seeds, dressed with a delicious honey balsamic vinaigrette. In a small jar, add all dressing ingredients and close tightly with the lid. Shake vigorously until combined. Just before serving, drizzle salad with dressing and toss until evenly coated. To make this recipe vegan, substitute the honey with maple syrup. I totally agree about shaking the dressing In a jar – completely makes the dressing easier and better-tasting! Happy New Year and all the best in 2018! I so need some good leafy greens after the holiday indulging!! This looks so vibrant and fresh! Happy New Year!! Take care. That’s a pretty salad!So bright and fresh! Love the idea of making and shaking the dressing in a jar! Thanks so much Deepika!! ♥ Hope you’re having a great week! I love homemade salad dressings and this is definitely one I need to try! Love how fresh and vibrant the salad looks! Happy January!